This silhouette shot really puts things into perspective. 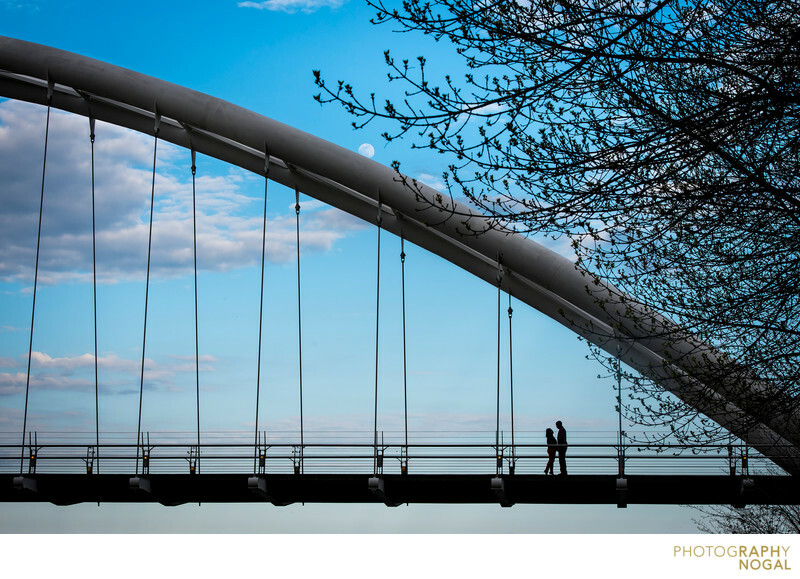 The couple is quite small in comparison the the grand structure of the Humber Bay Arch Bride. I waited until there was no-one on the Bride and took this photo - only after I phoned Oliver, who was with the couple, to repeat my directions on how they should stand. Its so important that during silhouette images, the limbs are all in the right place, otherwise it could create some unfavourable shapes. This image was taken with the Nikon D750 at 1/250th shutter, aperture f13, ISO 160 at 75mm with a 70-200mm f2.8 VR2 Nikkor Lens.